Jane asked for it - and Eyewear delivers. 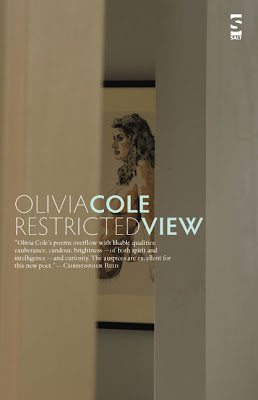 Not coal to Newcastle, but Cole to Holland - the restricted view of Olivia Cole that Jane Holland wanted to see: the cover of her debut from Salt, reviewed below by Mel Pryor. Enjoy. I'm sure that Jane will enjoy it. I very nearly saw Olivia Cole at Hay-on-Wye but my wife wanted to visit her daughter in Tunisia during the same week and, as usual, she won. I hope that you and your family are well.